Ex-Darren Weir sprinter Nature Strip hasn’t missed a beat in his build up to the Group 2 $200,000 Schweppes Rubiton Stakes (1100m) at Caulfield on Saturday. Nature Strip, above will line up for his new trainer in the 2019 Rubiton Stakes at Caulfield. Photo by Ultimate Racing Photos. Nature Strip was transferred from Weir’s stables to Chris Waller’s Flemington base and Sydney’s leading trainer said that the four year old has arrived in great order and has trained on well this week. “He’s turned up in great condition,” Waller told Racenet. Waller took Nature Strip to Moonee Valley on Monday morning for a solid hit out with regular race jockey Damian Lane partnering the gelding in the gallop. 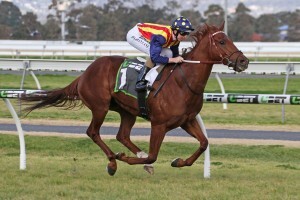 “We took him to Moonee Valley on Monday and Damian Lane was aboard. My theory behind that was new trainer, new jockey – not ideal but new trainer, old jockey – ideal,” Waller said. “Darren’s stable has been good. They’ve helped us where they can in terms of where the horses are at, which is important for the owners and the punters. The lightly raced Nature Strip is used to changing surroundings and the veteran of only twelve race starts will line up for his fifth trainer in the Rubiton Stakes. The Nicconi four year old has been through the stables of the disgraced Robert Smerdon, Robert Hickmott, John Saddler and Weir before finding his latest home under Waller’s roof. Waller has also taken over the training of Ringadingding from the disqualified Weir and said that both horses have settled in well at his Flemington stables. “This isn’t the first time Nature Strip or Ringerdingding have found themselves in a new stable for whatever reason,” Waller said. Damian Lane takes the ride again on Nature Strip in the Rubiton Stakes and has drawn the inside gate in the field that has been reduced to six runners following the early scratchings of Camdus and Sandbar. Nature Strip has been installed as the odds on $1.50 favourite for the Rubiton Stakes at Ladbrokes.com.au while Ringadingding is on the second line of betting at $5 for the Group 2 $200,000 Hyland Race Colours Autumn Stakes (1400m).